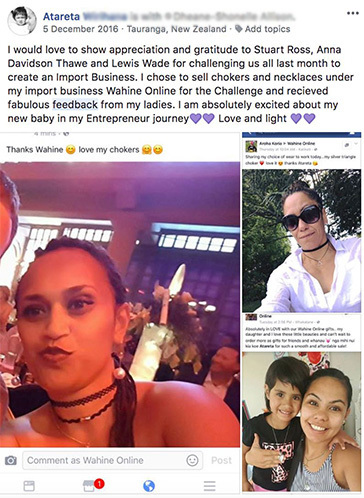 Want to transform your life and earn income doing something more meaningful to you? ...We’re passionate about changing lives. That’s what we really specialize in. SFM has given me the opportunity to build a business around the things that matter most to me – my family and my community. There’s no better reward than helping people transform their lives with a digital education that is relevant for todays online world. Thank you, thank you, massive thank you, to everybody at the SFM and DEA. 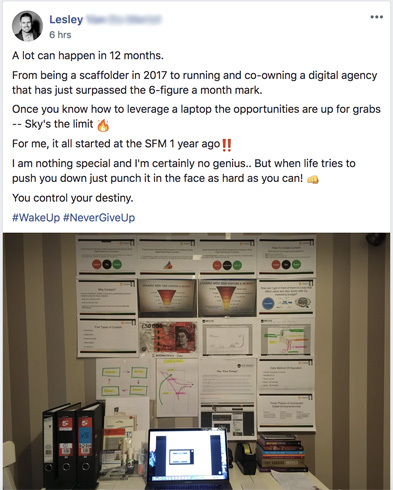 Last week I left my corporate sales job to become a fully fledged, self-employed, digital business owner. 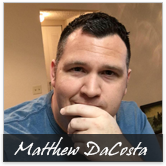 It’s absolutely everything under one roof that you need to succeed, not just as a new business owner, but how to succeed at life. I joined The SFM to create a life of personal freedom and to live where I want and travel when I want and I've achieved that, and my life today is truly my dream life! Now I have doors opening to possibilities I never would have dreamed of, because of the skills I've learned. Also, the friends within the community that will be with me for the rest of my life. In the first few weeks we started we were blown away by the possibilities that the digital world has for us, that’s why we’re so enthusiastic about this education. It’s a whole new way of living and working, and we love being a part of a global community. If you’re looking for something special, this is it. 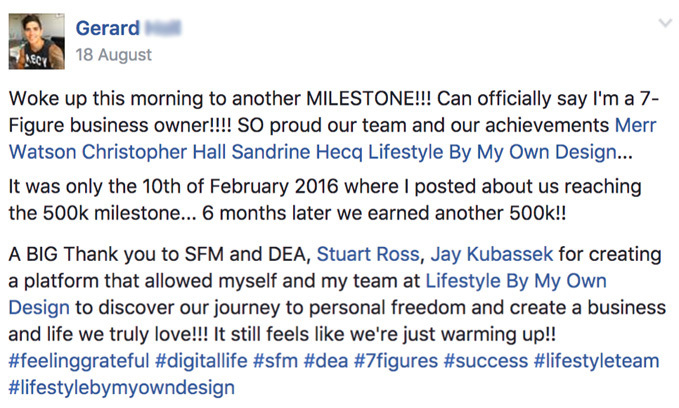 Chris and Gerard are now 7-figure business owners living a lifestyle of their own design. 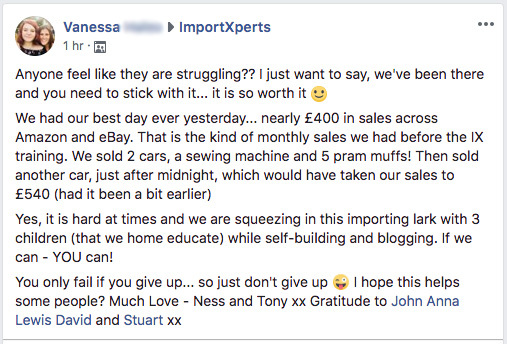 Vanessa has her best day ever (so far) ... nearly £400 in sales across Amazon and eBay. Turning her monthly results into her daily! 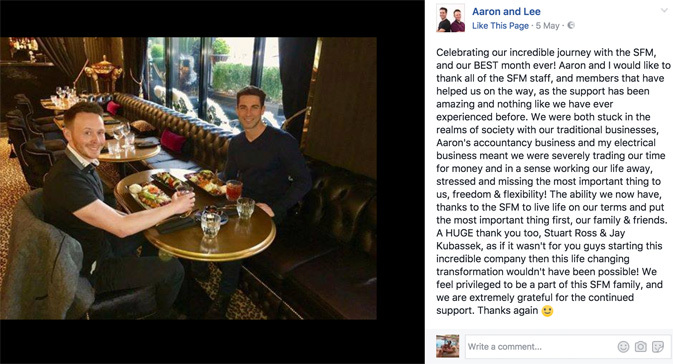 Aaron & Lee celebrating their best month ever and living on their own terms. 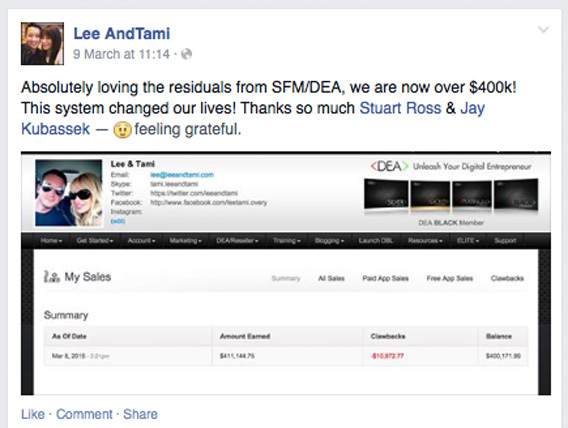 Lee & Tami are enjoying the residual results of all their hard work. 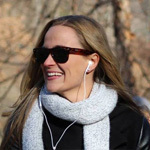 Angela - Reaping the benefits of comprehensive, online, expert-led training. Litsa reached a major milestone and is ranking on the first page of Google. 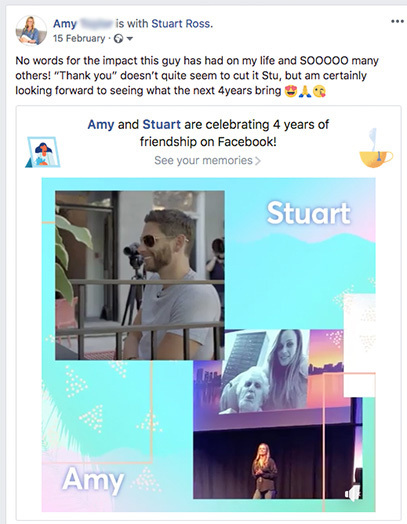 Stuart - In-person training plus active engagement is a recipe for success. Diana - There’s no substitute for student-focused, hands-on learning. Atareta - Community led challenges increase your chances for success. 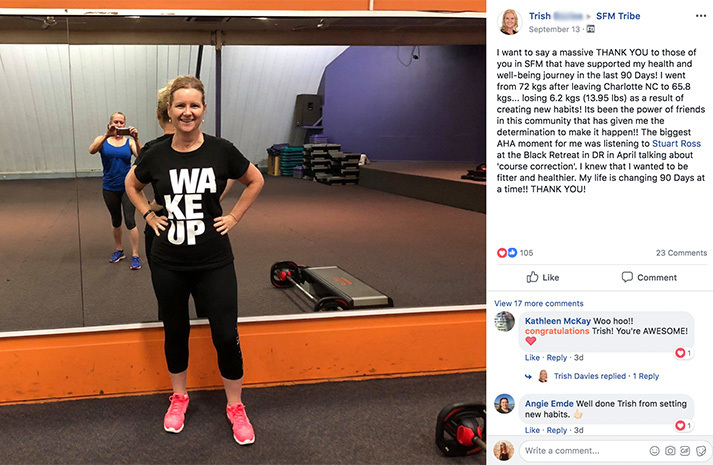 Trish - When your community supports your health and wellness journey, everybody wins! Roy applied his newly learned skill set and is ranking on the first page of Google. Amy Taylor - When company Founders make themselves accessible, their communities thrive. 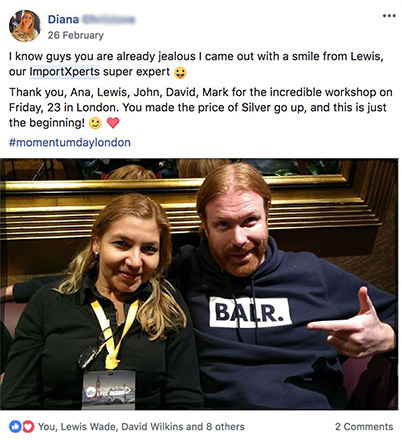 Kathryn is taking action on our training and exploding her business. 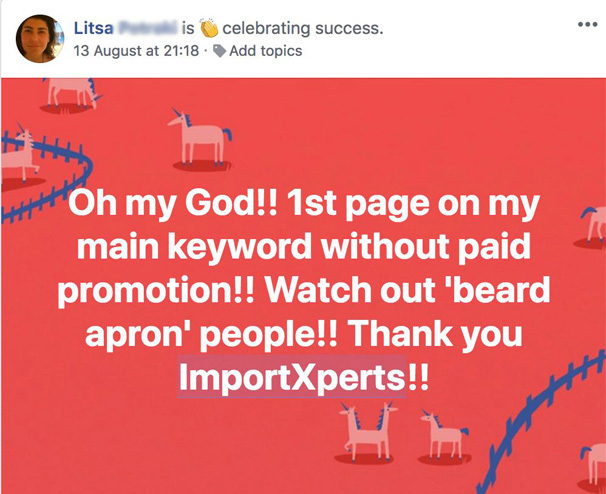 From scaffolder to digital business owner, Lesley has surpassed six figures a month! From previously working in a cubicle as a Marketing Officer. To now traveling the world with her partner Gerard. 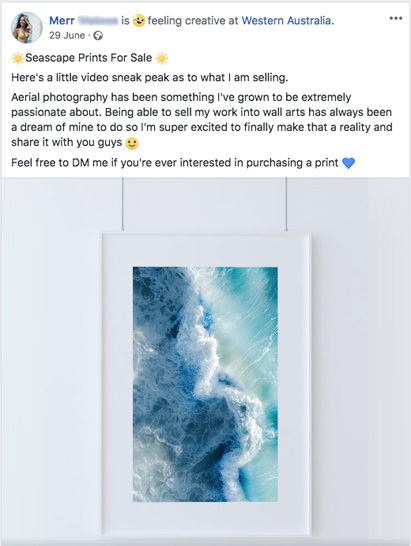 Merr sells her stunning aerial photography which she captures on their various adventures. Search and access over10,000 expert-led courses in business, creative and technology. We’ve got everything you need to create a successful online business, that you love to work on. But, we also concentrate on something a lot more special. 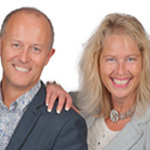 We care about your personal development and mindset mastery too, because we know that’s another fundamental key to your online, business andlife success. The question is... what will you do with your digital life?